Look no further than Marriott's Timber Lodge for your South Lake Tahoe visit. Located within Heavenly Village, our resort features sophisticated one, two and three bedroom vacation rentals with full kitchens, separate living and dining areas and washer/dryer. For those who need a little less space, we also offer modern guest rooms providing a king bed, sleeper sofa, microwave, small refrigerator. Save your appetite for FiRE + iCE Grill and Bar, our resort restaurant. Children are sure to have a blast at our onsite activity center. We offer great conveniences including bell service, ski storage and valet parking. 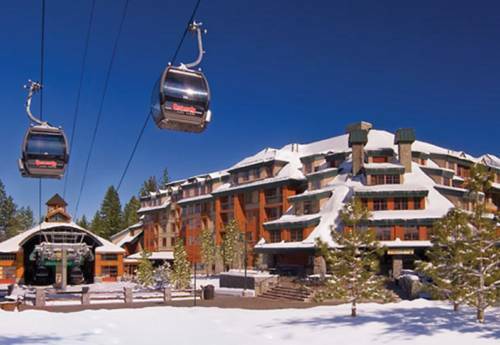 If you are here to ski, you will find the world-famous Heavenly Gondola just steps away waiting to carry you to the top of the slopes. The South Lake Tahoe vacation you have always dreamed of can become a happy reality at Marriott's Timber Lodge. This trendy Asian restaurant in South Lake Tahoe's bustling Heavenly Village features an improvisational Mongolian-style grill and bar. Create your own custom meal, using your favorite ingredients, and watch as a chef prepares it on an open grill. The quick stop for an assortment of essential snacks and sundry items. Featuring Starbucks coffee.